In China, the recent shutdown at Daqing’s cracker has caused the PP market to gain some lost ground and has triggered some speculative buying this week, as per the pricing service of ChemOrbis. However, it was only last week when many sellers were complaining about their slow import business due to competitive local prices. Even though the sentiment has somewhat improved recently, trading activity remains limited in China’s PP market and most players continue to lack a clear outlook on the future market trend. A trader in Shanghai even said that producers were diverting some of their allocations to other global markets rather than lowering their prices to China. Mainstream PP suppliers from the Middle East have started to approach the Turkish PP market with firmer prices this week. Concerns about diminishing supplies in the local market have triggered a firm trend recently in the Turkish market, which is also contributed to by the consecutive hikes of the domestic producer Petkim. As can be seen from the graph above, this situation is resulting in the best possible margins for Middle Eastern producers after adding an approximate freight rate and applicable customs duties on top of their estimated export prices. 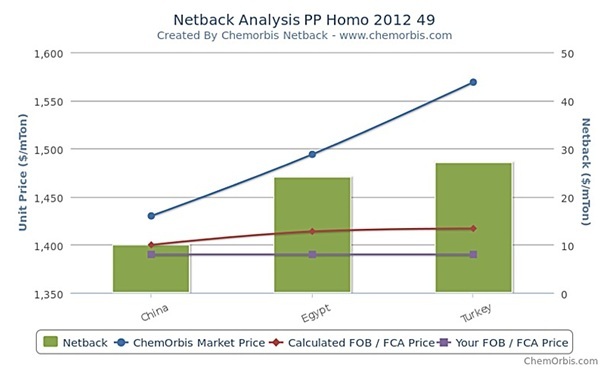 Egypt is carrying a larger premium over China too, although it is still below Turkey’s, as per ChemOrbis. This is because mainstream Middle Eastern suppliers have come with different pricing strategies to Egypt this week since market conditions are not so strong in the country. A Saudi Arabian producer rolled over its PP offers for December while another producer revised its offers down from the initial announcements. Another producer, who lifted its offers for December, is also expected to revise its offers down in the near term.